Travel back in time to the seamier side of Chicago on this guided bicycle tour that takes you to the Southside hangouts of notorious Chicago gangsters like Al Capone. 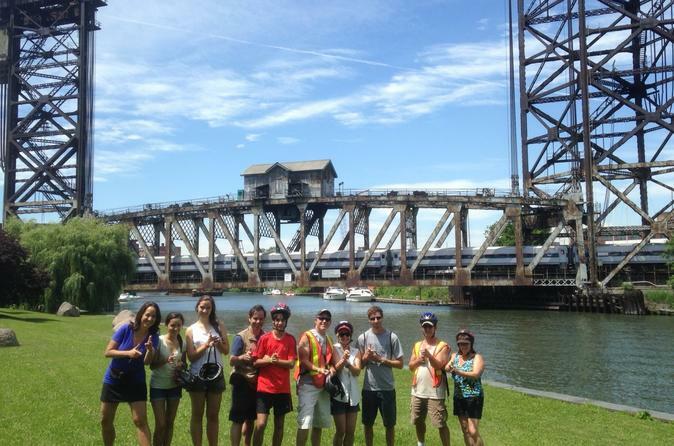 Learn the history of the Chicago Outfit as you cycle through Bridgeport, Chinatown, Palmisano Park and more. Bike along scenic paths on Chicago’s Lakeshore en route to see famous mob homes and haunts, Chicago’s former red-light district, and Al Capone’s stomping grounds. You'll get a glimpse into the Windy City's underworld while enjoying a fun and informative bike ride! Meet your guide and get outfitted with safety gear and a bicycle. From there, pedal off to learn about Chicago’s mobster history. Your expert guide leads you past the territories of Al Capone and other famous gangsters who ruled territories of Chicago’s South Side during the Prohibition era. Along the 13-mile (21-km) route, cycle past former mob homes and hangouts that were popular with gangsters in the early 20th century. Many of the homes you see belonged to members of the Chicago Outfit, a crime syndicate that was once the biggest criminal organization in the Midwestern United States. Your tour takes you other sites related to the mob, such as Chinatown, Bridgeport, the old Levee District, which was once a red-light district. Stop at Palmisano Park, an innovative park that was built on the site of an old rock quarry and former dump. Even this lovely green space has a scandalous story that was exposed by reporters from the Chicago Sun Times in 2004. Your tour isn't all about crime. It also take you to scenic sites such as the Prairie Avenue District, which became a fashionable residential district after the 1871 Great Chicago Fire and is on the National Register of Historic Places. Bike along lakeshore paths that afford great views of Lake Michigan, and glide past McCormick Place and Museum Campus. You'll even enjoy classic Italian beef sandwiches at a Chicago original hangout. Expect to ride about 13 miles on a route considered moderate to advanced, with plenty of stops to rest and listen to your guide’s informative commentary. Your tour ends after about three hours when you return to your starting point.